So it’s Monday, but my guy just returned from a business trip and a quiet day was in order. 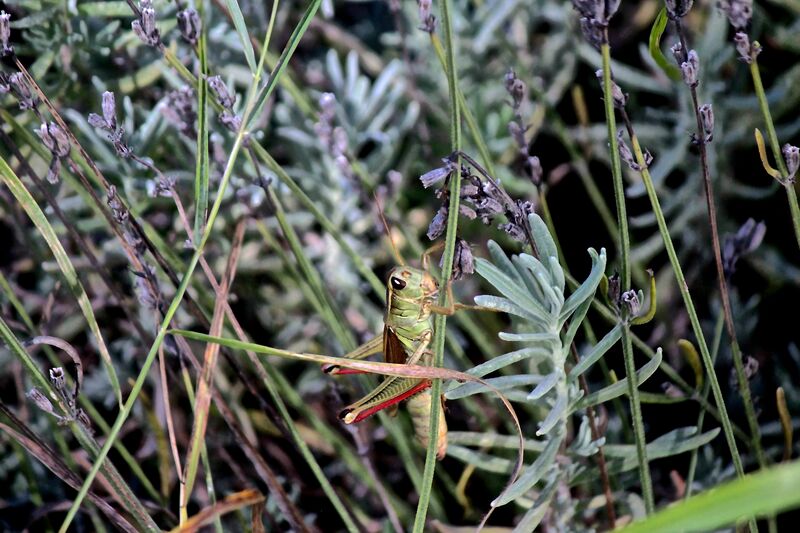 That meant I had time to stalk the poor red-legged grasshopper that lives in the garden. 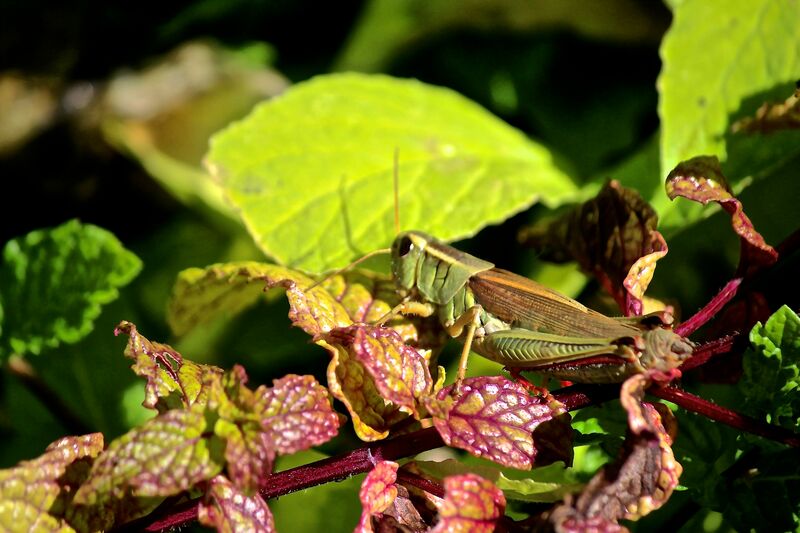 Like me, it warmed itself in the sun before moving about. The temperature was 37° this morning. 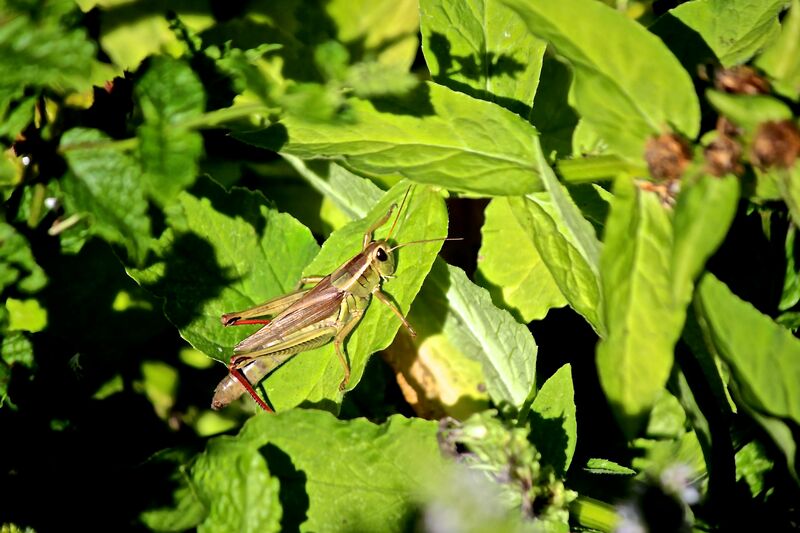 Like any insect, a grasshopper’s body consists of three main parts: head; thorax; and abdomen. 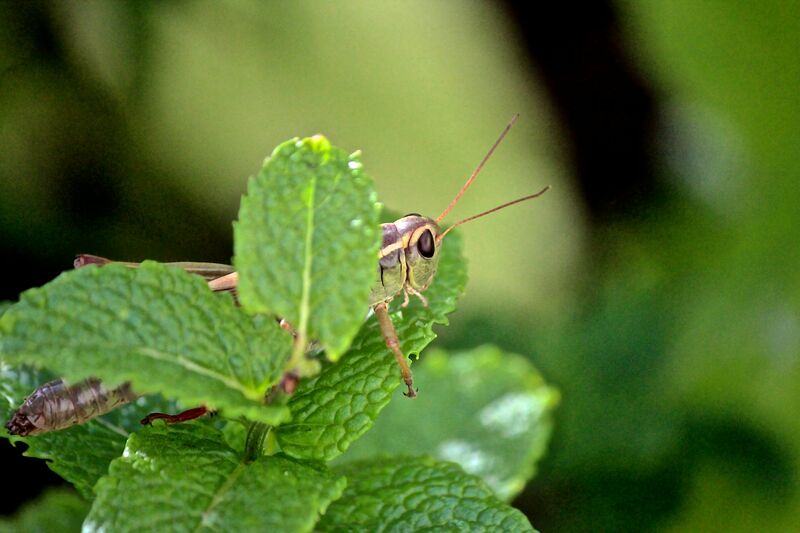 This short-horned herbivore uses its antennae to feel about the mint leaves. 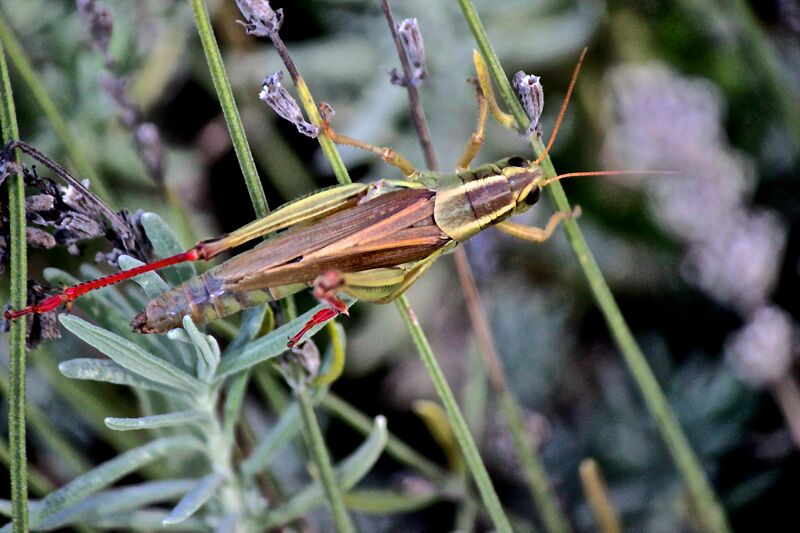 The pair of antennae serve as sensory organs. 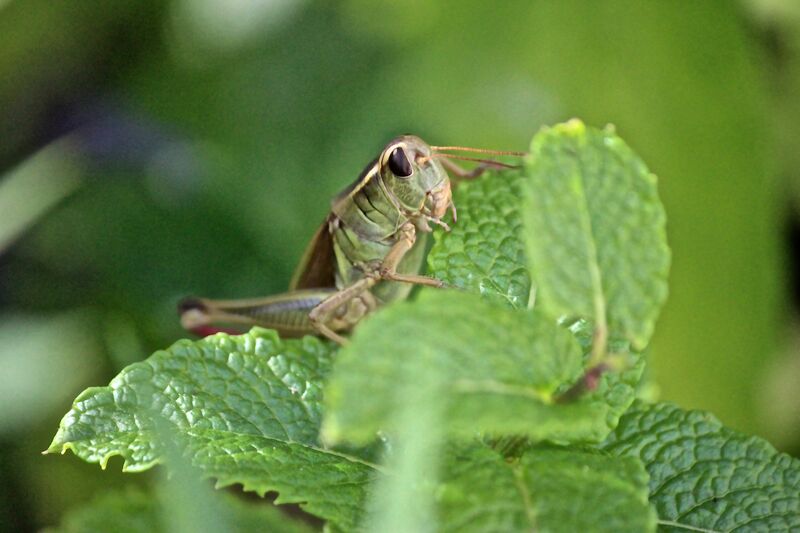 The head includes the antennae plus two compound eyes and three simple eyes or ocelli (yup, 5 eyes altogether). 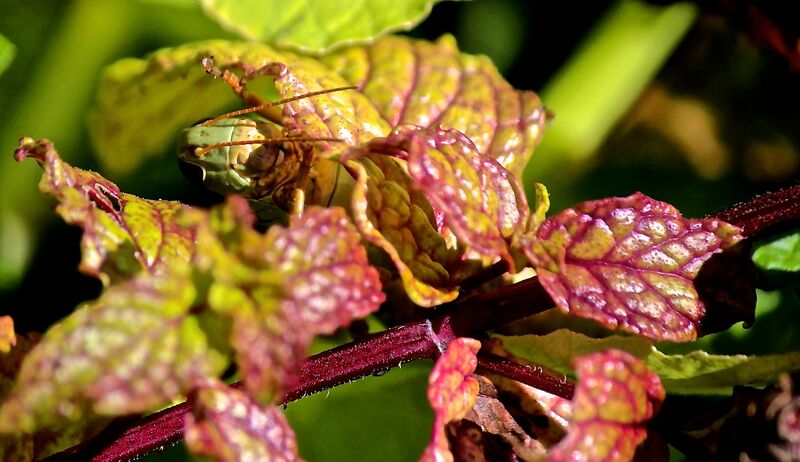 One ocellum is located between the antennae and the other two are near the compound eyes. The head also features several mouth parts including the palpi, which are used to handle food.The short palpi remind me of fangs. The thorax or middle part of the body actually consists of three separate parts. Closest to the head is the prothorax, which supports the first pair of legs. Next is the mesothorax, providing support for the middle pair of legs plus the first set of wings. And the third section is the metathorax, which supports the third and largest pair of legs plus the second pair of wings that are used for flying. 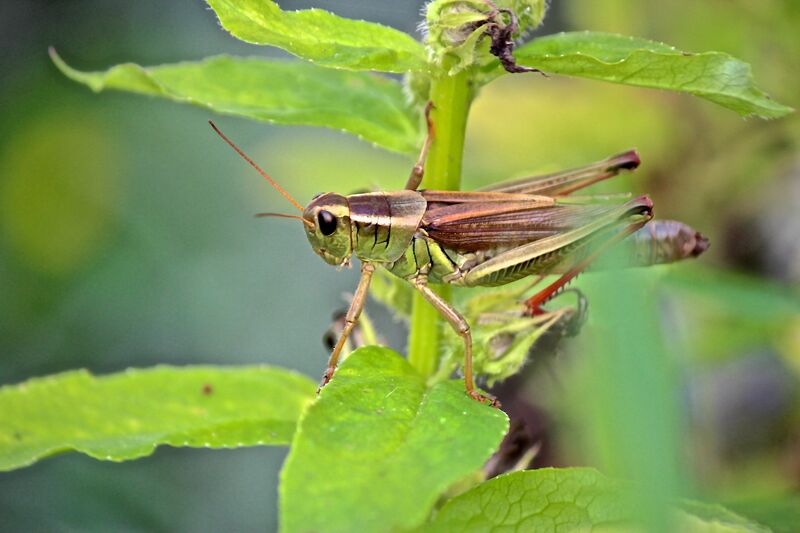 The first two pairs of legs are short and used for walking and eating, while the third pair is used for hopping. Each leg consists of five parts. The largest part of each being the femur–identified easily on this specimen by the herring-bone pattern. Notice the rounded area at the bottom of the femur–that’s the knee. The knee connects the femur to the more slender tibia, which has a spiny appearance. The abdomen or third section of the body begins behind the metathorax. 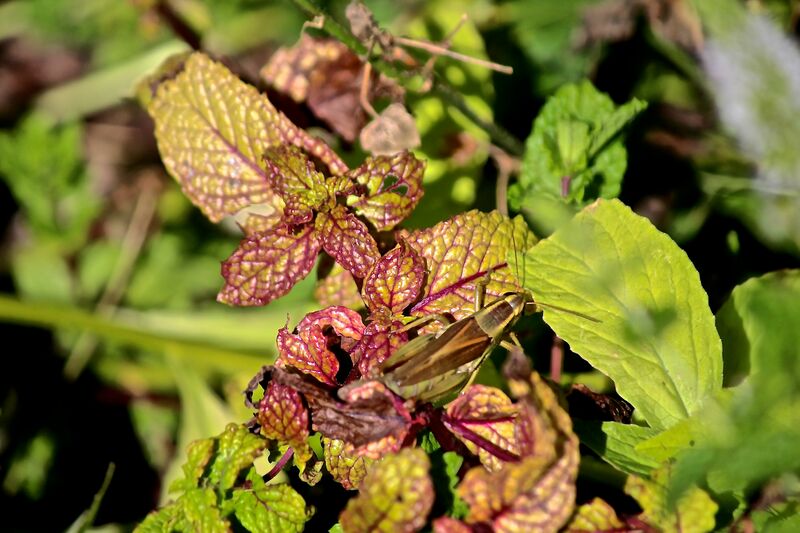 The first segmented section of the abdomen features a pair of “ears” (tympanum) that are located under the wings (or behind mint leaves). 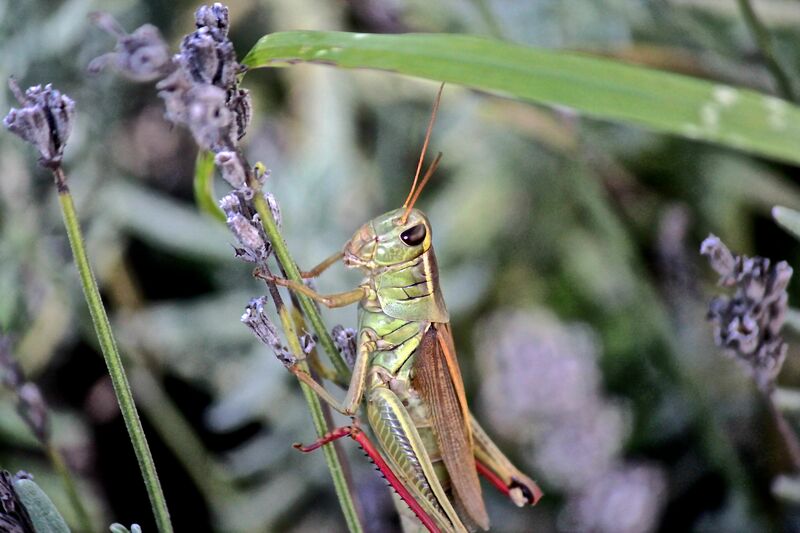 A grasshopper can’t necessarily hear like we do, but it can distinguish the sounds of love–the intensity and rhythm of a male’s song. Each of the other segments features a pair of dots that are actually spiracles or openings for breathing tubes–there are five sets total. 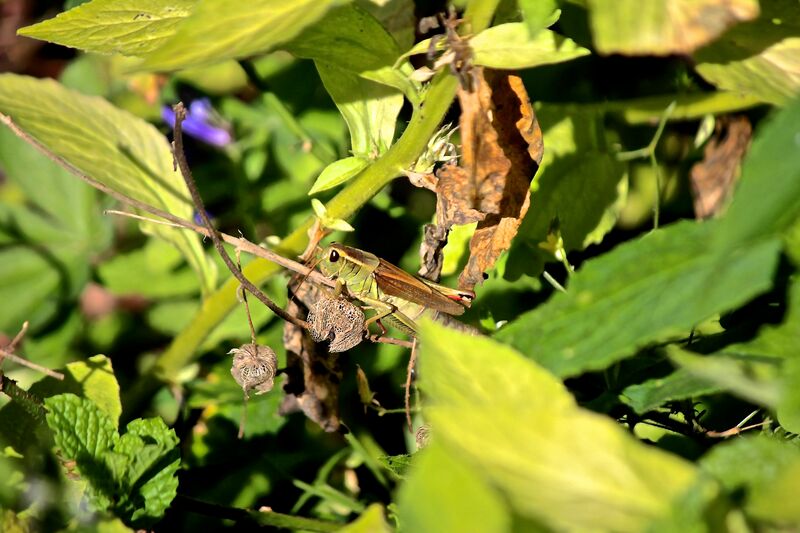 And at the tip of the abdomen is an ovipositor, the egg laying appendage. 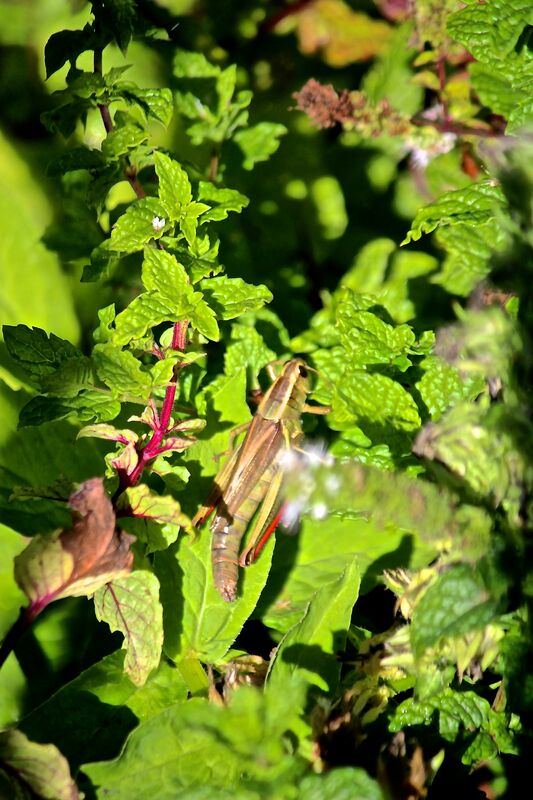 Camouflage protects the grasshopper from predators, which includes birds, spiders, skunks, shrews, snakes, toads and salamanders. They all frequent our yard. 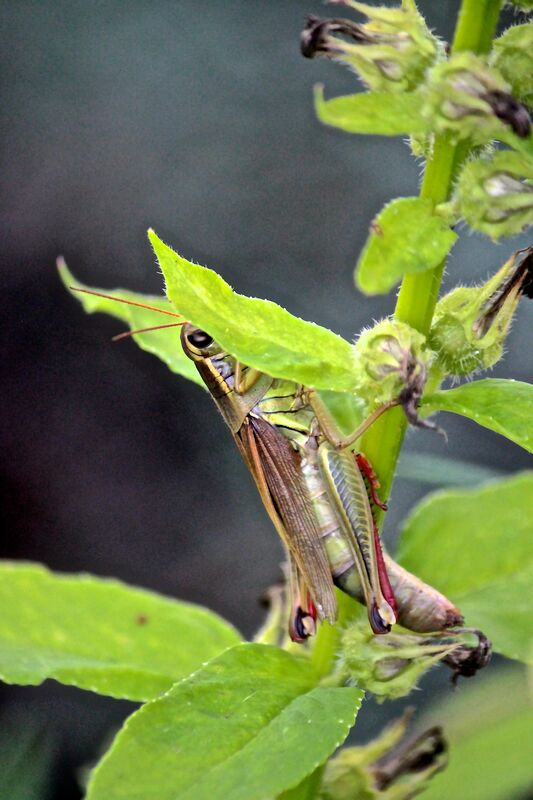 Each time I returned to the garden today, I had to stand still and scan the area for several minutes before I realized that I’d found my friend. Of course, I’m only assuming it was always the same one. Sometimes it was an easy find. 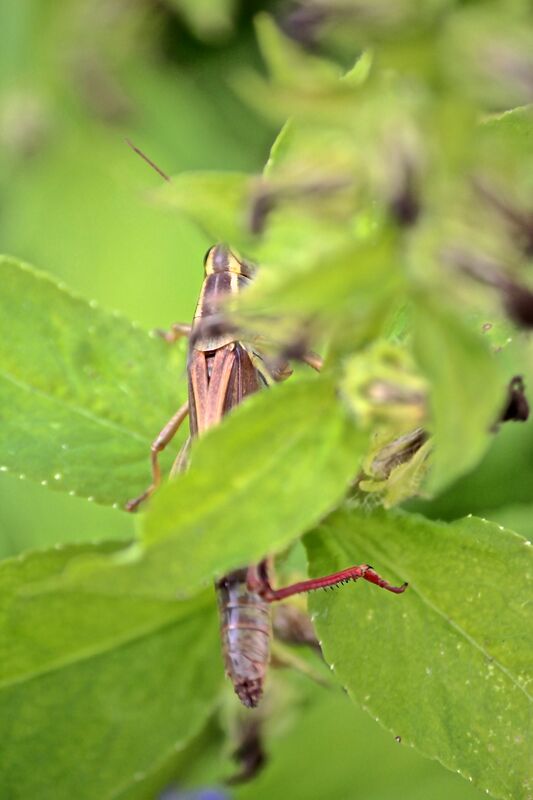 Stalking a grasshopper–not a Mondate, but still a fun focus. Glad you enjoyed it, Ursula. Thanks for being such a faithful reader.